Llangynwyd and Maesteg donate £200 for the caravan appeal. to talk about our Away From It All (AFIA) project. It was a wonderful, friendly evening. Grateful thanks were expressed to all members of the branch for fundraising a marvellous sum of £200.00 for the caravan. 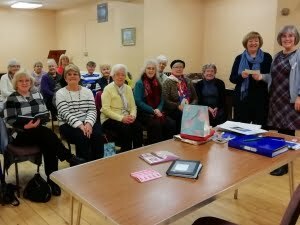 The branch visited the caravan in Trecco Bay, Porthcawl last year during the Open Week in July and they are looking forward to their visit again this year. Open Week this year is July 9th – 12th where we would like to welcome as many of our members as possible to share a cuppa and see how our wonderful project works. Lowrie is more than willing to come to any branch to talk about the caravan – please don’t hesitate to contact her.